During her months in a Gestapo prison in 1936, the young labor activist Gisa Peiper follows a thread of poetry, trying to steady herself: “Remember this also when you grow old. / Remember there is art, there is poetry. / Remember a skin of leather and steel. / Remember to grow old.” The ripples of repetition spread through every act of Silence Not: A Love Story. As the play unfolds, memory speaks. A younger, idealistic Gisa speaks to her future self, who carries a false passport to escape Nazi-occupied Germany. The ties of poetry and language are strong, linking characters and events, and giving Silence Not, A Love Story a meditative, pure tone that reiterates the need to face oppression with unflinching love. 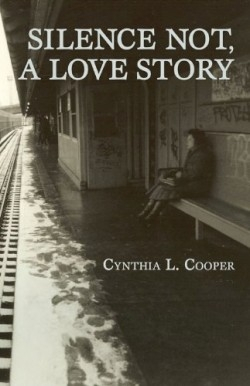 Silence Not, A Love Story is a new play by Cynthia L. Cooper, a two-time winner of the Jerome Award fellowship. Cooper is clearly a playwright at the height of her powers. She easily balances themes of empowerment, struggle, and equality, and raises the stakes by addressing the atrocities of the Holocaust. Rather than take a preachy approach to such serious subject matter, Cooper uses a deft touch to incorporate historical detail and human emotion. Her primary characters, Gisa and her lover Paul, are members of a left-wing labor movement, the International Socialist Kombat League (ISK). Their conversations bring to life the day-to-day struggle against totalitarianism. The details of ordinary life are just as gripping as the horrifying statistics. Finding that the ISK headquarters have been vandalized by Brown Shirts, Paul rages, “They do whatever they want! Ignore the law. Or change the law so that the law isn’t the law, but a perversion of the law, and the things decent people do are illegal…People in Hamburg won’t stand for this. This is a labor town.” He and Gisa discuss the rising violence against anti-Nazi groups, and the ISK leaders’ escape to England. Cooper weaves the ordinary and the political into a single braid, showing all aspects of the resistance in a comprehensive, effortless way. Unlike many writers, who hammer away at the suffering caused by the Nazis, Cooper lets the facts speak for themselves. The result is striking and breaks new ground in much-trodden soil. The beating heart of Silence Not, A Love Story is the romance between Gisa and her fellow activist Paul. She is Jewish, a star pupil. He is Catholic, Aryan, and blue-collar. It seems an unlikely match, but Gisa and Paul grow closer through their mutual devotion to the ISK’s ideals. Although separated for safety or political reasons—during interrogations, Gisa must pretend not to know Paul’s name—their bond is immediate and unshakeable. When Paul escapes to Paris on his bicycle, he asks Gisa to come with him. “I’ll ride to the border in two days, I think. A single one, if it isn’t rainy. I could even carry a passenger on my bike.” She refuses, saying, “There’s much more work to be done here.” They love one another fearlessly, but both put their political work first. Cooper gives the characters subtlety in their romance. She portrays Gisa and Paul’s emotions with light strokes, rather than letting the romance dominate the story. Pure feelings, romantic and idealistic, round out the theme of “love conquers all.” Although Cooper’s postscript reassures the reader that Paul and Gisa do end up together and survive the Nazi occupation, the play itself is vague on the subject, leaving the lovers in dangerous limbo. By keeping Gisa in the foreground—treating her as an individual and the play’s clear lead—Cooper maintains focus on political, not personal events. The action rises steadily to the last act, and only in the final pages is the tension lightened. Paul, once off stage, only appears in Gisa’s memories. He does not affect Gisa’s decisions. In a different kind of play, she might have tried to meet him in Paris, or planned to escape together. But instead, Gisa is a strong, independent character, and a refreshing alternative to many of the love-reliant female characters in contemporary theater. Thought-provoking without being abstract, historical without being condescending, Silence Not is a heady, beautifully written play. Worth reading several times, it strikes a lovely balance between poetry and reality, bringing to life a diverse cast of characters in a challenging time period. Cooper reminds us, in the closing lines, that true resistance to oppression comes from the act of love—and to love wholeheartedly is the most radical act any person can commit.